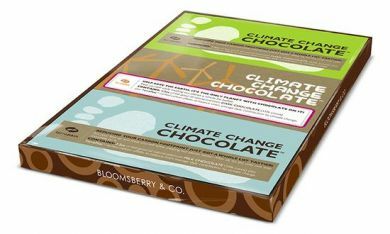 From Climate Change website: "Our Climate Change Chocolate bar is meant to educate while tasting great. it comes in a wrapper with 15 tips for lightening your environmental impact. And of course, thanks to Bloomsberry & Co., you can be sure the finest chocolate is attached to these green lifestyle lessons. Climate Change Chocolate comes with a verified TerraPass offset of 133 pounds of carbon dioxide reductions, the average American's daily carbon impact. We hope this small offset will be the first taste of a lower-carbon lifestyle for cocoa lovers who decide to take responsability for their climate change impact. In addition, the carbon emission associated with the production and distribution of the chocolate bar has been belanced out."